As Sagar Gupta watched a 3-D printer on a lab countertop construct a jumbo pencil eraser-sized, white plastic cylinder of what looked like a shell holding inter-woven letter Xs, he remarked that the only limitation to what you can print is the size of the printer. “The timing is perfect, otherwise we wouldn’t have been able to afford it,” Chung-Ho Lin said of the availability of cheaper 3-D printers within the past couple years. The two men were acutely aware, as the printer continued its methodical manufacture, that they may be architects of the first steps in a bio-chemical revolution. It’s a revolution that could be hugely profitable financially and may help to save lives on battlefields, clean up some kinds of pollution and enable humans to venture further into space for a cheaper cost, among other things. To understand how this cross-disciplinary team working in George Stewart’s lab at the Bond Life Sciences Center got there, we have to back up a little bit. Their work began three years ago with a project to develop technology to reduce the cost of converting cellulose into glucose for biofuels — essentially the process by which raw plant fiber from wood or leaves is turned into a sugar that can be more efficiently burned to produce energy. “That has been the bottleneck for the biofuel industry,” said Lin. 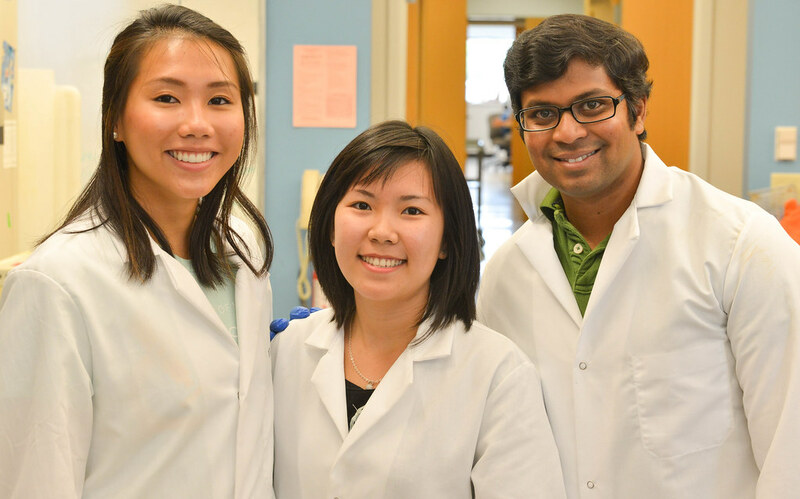 The team — consisting of Lin, a research assistant professor at MU’s Center for Agroforestry; Stewart, Hsinyeh Hsieh and several undergraduate and recently graduated students including Gupta — already developed E. coli bacteria that can mass-produce engineered enzymes to convert cellulose into glucose. These enzymes speed up the reactions and reduce the cost because they have linkers attached to them — protein hooks that let them be recovered after a single use as catalysts in biological reactions, rather than having to throw them out. Hsieh said she developed this with Stewart’s input, and the assistance of a recently graduated student, Che-Min Su. However, the team needed a platform for the linkers to hook onto — something they could continuously use to reel in their catch. The answer in their search for the correct platform arrived when affordable 3-D printing technology came onto the market. 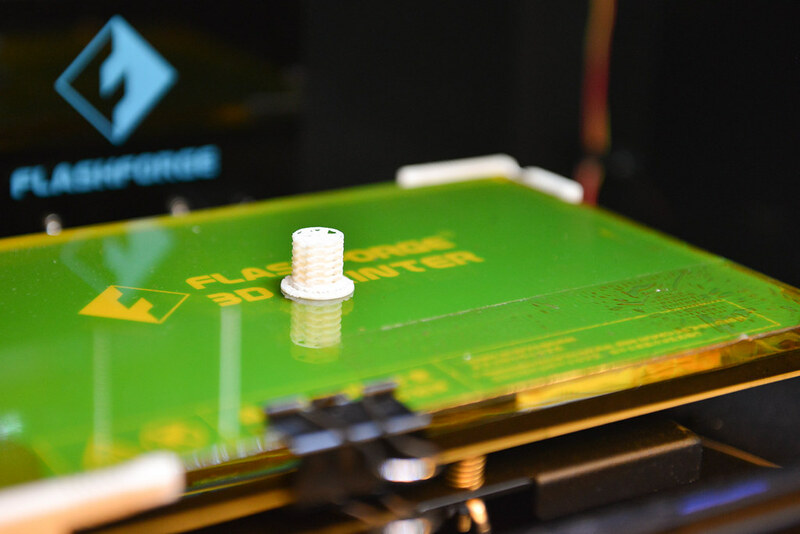 With their own 3-D printer in-house, they custom-designed different platforms for their experiments and completely bypassed having to shop around with different fabrication companies. All of the ingredients were there with that plastic cylinder Gupta and Lin watched print. The team now had a cheap way to mass produce and repeatedly recover enzymes. With this capability, they could produce a more efficient bioreactor — a controlled, isolated system in which desired reactions can take place with higher outputs of quantity and quality of a desired product. It’s much like the more familiar concept of a nuclear reactor, which controls and isolates a nuclear chain reaction to harvest the most energy possible. The catalysts in that reaction are radioactive particles that give off heat as they decay. In a physical reaction, the heat released boils liquid water into gaseous steam, and the steam turns a turbine generator that makes electricity. But in the team’s bioreactors, catalysts are enzymes that chemically react with cellulose and transform it into glucose instead of electricity. The glucose can be fermented further into butanol that can ultimately be used for liquid fuels to power vehicles. 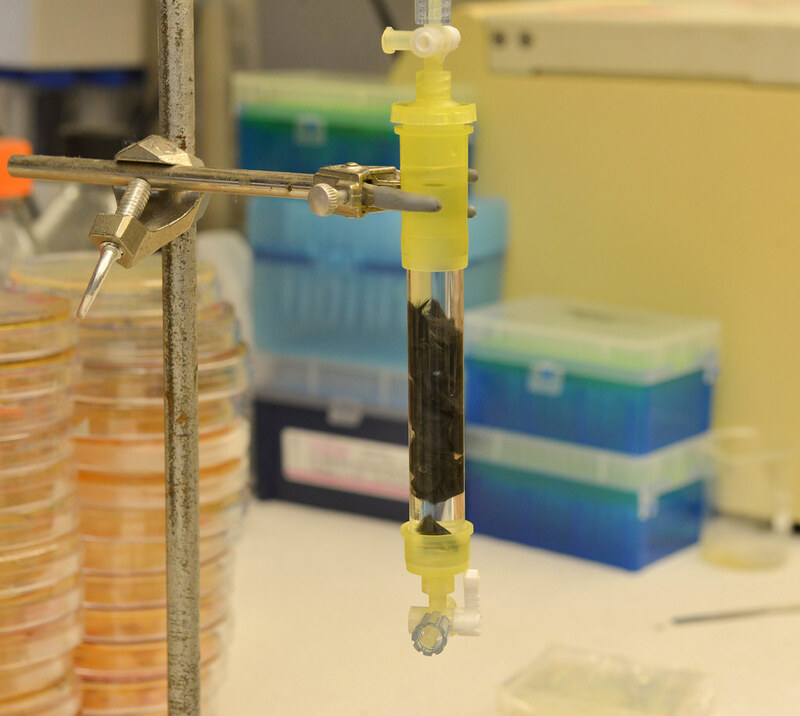 While only at a bench-top, proof-of-concept scale, the team’s first bioreactor has lasted more than four months. With prospects to increase its size, they “could be saving at least $10 to $12 million per year on an industrial scale,” said Gupta. Gupta graduated in May from MU with an MBA, and now works for Lin. That estimate is just for one individual bioreactor. Begin to multiply it, and the cost-savings add up very quick. “Nowadays, probably a majority of pharmaceutical companies have already switched their manufacturing process into the enzymatic process. One thing nice about the enzymatic process is that it can eliminate [the need for] a lot of hazardous chemicals. They also tend to have a better yield,” Lin explained. Lin added that there is a bonus of complexity within this kind of 3-D platform system. Individual enzymes have different linkers, and this allows for multiple enzymes to catalyze reactions and be recovered on the platform at the same time. This is especially cost-saving because the conversion of cellulose into glucose requires three different kinds of enzymes. “Because of this high specificity, we don’t need any enzymatic purification process,” he said. Once the enzymes hooked to a platform start to naturally decay, the team can simply remove the decayed enzymes by a hot water bath and soak it in a new batch of enzymes, just like swapping out an empty printer cartridge for a full one with fresh ink. 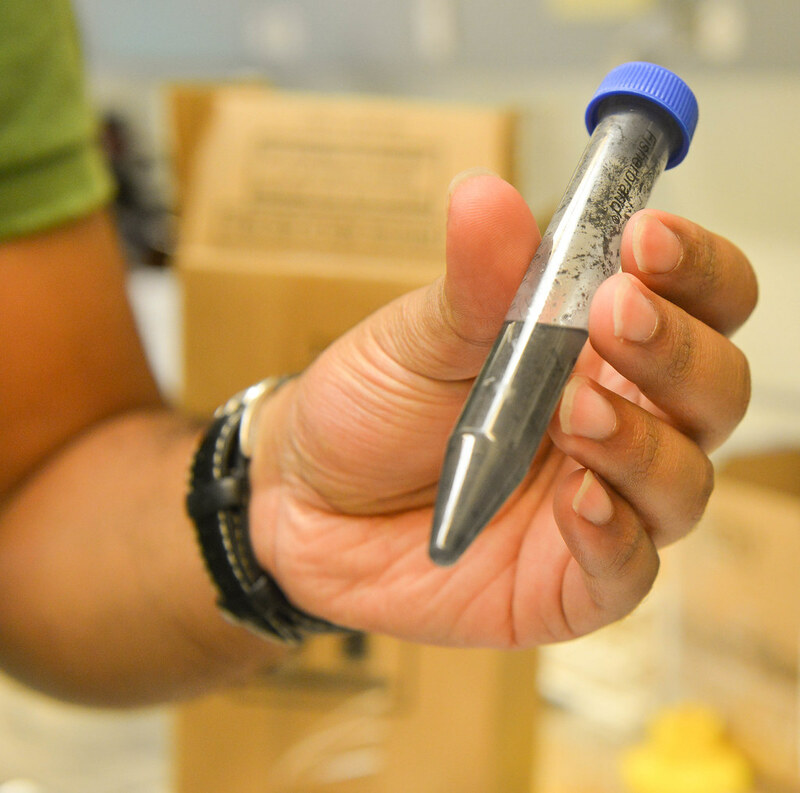 While their primary focus is on biofuels, they are very aware that more efficient and cheaper bioreactors could have huge implications for a broad spectrum of industries. One use they are developing could effectively transform one blood type into another using enzymes. “This is not a completely new technology, but in the past, I would say back in the 90’s, some people tried some clinical trials and they ran into a problem, because a lot of times after the conversion, [loose] enzymes would get into the recipients’ bloodstream and cause an auto-immune reaction,” said Lin. However, by being able to immobilize enzymes with their linkers on this 3-D device, they should be able to get around that problem, he said. “I think there’s great potential for the soldier on the battlefield,” Lin cited as an application for the technology. A field doctor or medic wouldn’t have to worry about waiting on a certain type of blood for a transfusion, because they could convert another batch of blood into a universal-donor type. There are other potentially massive implications for the battlefields of the future. “You can immobilize anti-microbial, anti-fungal and anti-inflammatory enzymes on a surface to use as a wound-healing patch,” Lin said, noting that such a patch could be used on the battlefield, as well as for cosmetic surgery recovery. But the applications don’t stop there. Other uses could use enzymes to clean up TNT residues leeching out of unexploded ordinance like cluster bomblets, mortars, rocket-propelled grenades and landmines buried in the ground before the toxic residues contaminate groundwater. Even within the confines of biofuels, there’s a strong military market. By 2020, the Navy wants 50 percent of its total energy consumption to come from alternative sources as opposed to petroleum-based fuels — part of a broader strategy to go green. The U.S. military in the near future wants to reduce the cost of its energy consumption and secure a stable domestic supply of energy. According to the U.S. Government Accountability Office, from fiscal years 2007 to 2014, the Department of Defense bought 32 billion gallons of petroleum-based fuels at a cost of $107.2 billion. Away from the military sphere, Lin detailed other uses for cheaper, higher quality enzymes. It could purify and recycle urine into clean water on space flights on for astronauts or convert waste into energy with an ammonia fuel cell that’s already available. Mass-produced enzymes can be used for water treatment on earth, too. Pollutants like dioxin and herbicides like atrazine that contaminate soil can be bio-remediated in the same way that TNT residues can be cleaned up. The food industry already uses enzymes as flavor removers to remove strong tastes from products like beer. To call the team’s work revolutionary might be a bit premature. There is a whole process ahead of them, including patent filing and university reviews, before the team can approach investors with the assurance their discoveries are legally protected. And, future investors will ultimately help determine how the technology is used. But, Lin and the others might just have found themselves in the right place at the right time to make major breakthroughs, and that’s not all due to just advancements in technology. “We have identified new directions and found a new niche to be competitive. I think the most important resource we have is people, and their brains,” Lin said. 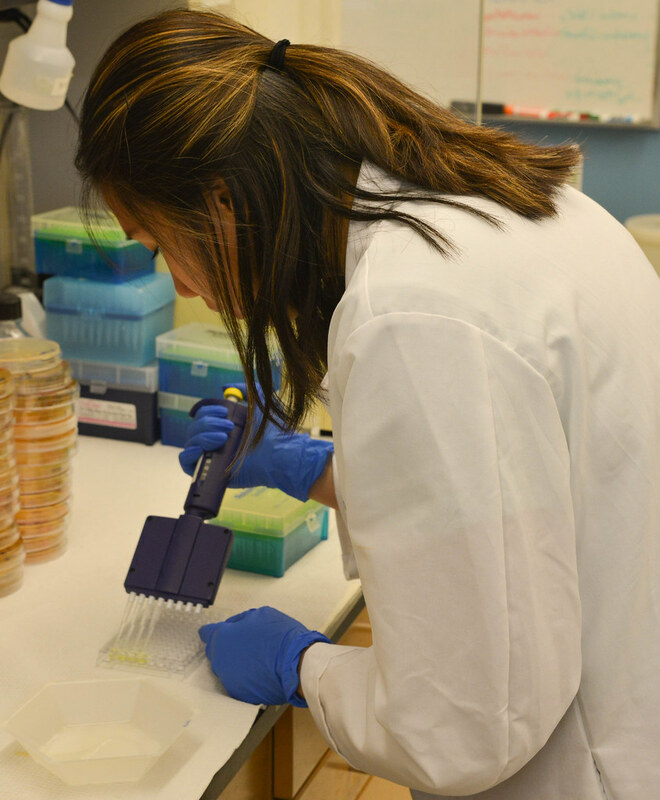 Hsinyeh Hsieh, a veterinary pathobiology research scientist in George Stewart’s Bond LSC lab, coordinates this project. Hsieh is an expert in gene fusion, enzyme production and characterization and enzymatic blood type conversion. 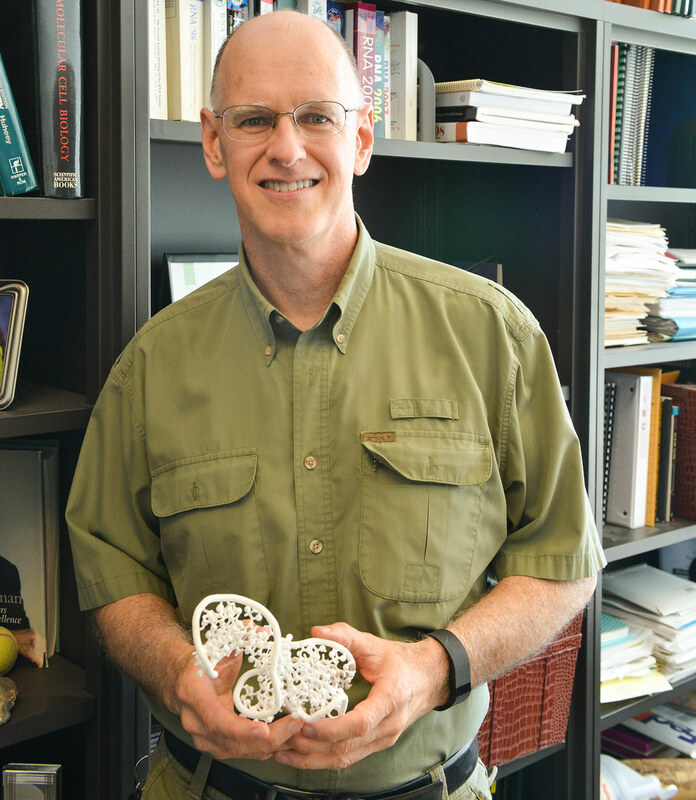 Stewart is a medical bacteriologist, McKee Professor of Microbial Pathogenesis and chair of Veterinary Pathobiology at MU. 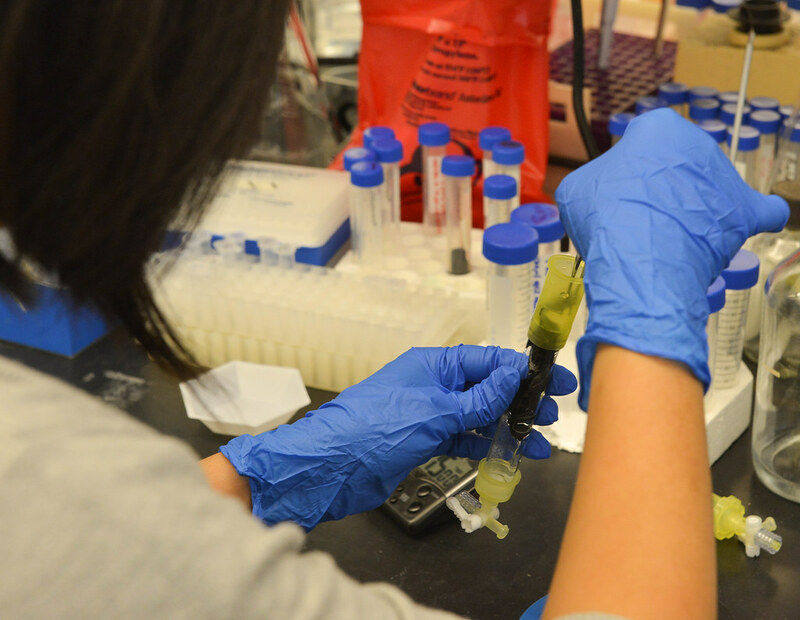 Lin works with Stewart and Hsieh to develop concepts, design prototypes and assemble the rest of the team — students and recent graduates — that optimizes the enzymatic reactions and the physical and chemical aspects of their bioreactor system. Minh Ma is a junior studying bio-chemistry. Mason Schellenberg studies bio-engineering, will be a senior and worked to find the most efficient platform design that the team’s 3-D printer could produce. Hien Huynh is a recent graduate who works on immobilizing enzymes. In addition to his MBA, Gupta also has a background that includes nano-technology, molecular engineering and financing. He concentrates on the feasibility and market potential of the team’s work. Tiger Energy Solutions, LLC is the team’s industry partner — a spinoff startup from the team’s research project . Their focus in the development of a cheaper and higher quality method of converting cellulose into glucose for biofuels is to produce aviation biofuel. Tiger Energy serves as the interface between the team and industry while the team’s work is scaled-up for commercialization. This past weekend not only ushered in Mizzou’s first home game of the season, but the return of Saturday Morning Science. The weekly lecture series connects the Columbia community with MU scientists and their research, from bio-engineering to volcanology to anthropology and linguistics. 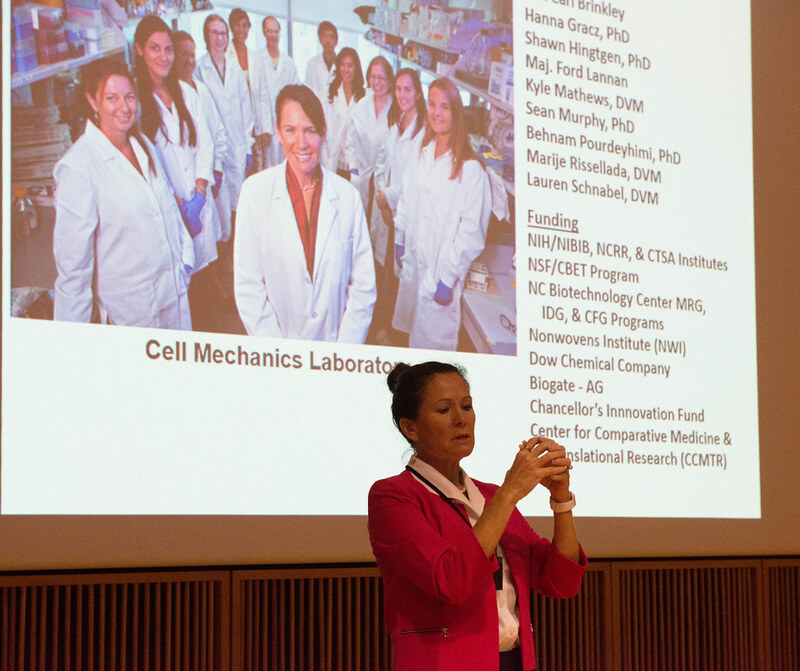 Elizabeth G. Loboa, dean of the College of Engineering, kicked off the semester with her talk on tissue engineering in the age of drug-resistant bacteria. Tissue engineering is about turning cells into tissues and organs, for example, fat-derived stem cells into muscle, bone and cartilage. The tissues take shape on tiny scaffolds that are bio-compatible and biodegradable. The Loboa lab does this, but they’ve added an extra layer to their research: Loboa’s scaffolds also act as pipelines that deliver wound-healing and anti-bacterial compounds to cells as they grow into tissue. The idea is to reduce infection, inflammation and scarring as the wound heals. “We’re trying to kill these bacteria while helping these stem cells become the cells we want to create,” Loboa said, about her research at the University of North Carolina-Chapel Hill and North Carolina State University. Using a process called electrospinning, Loboa’s group makes scaffolds shaped like porous fibers, sheaths, or hollow sheaths. Depending on their structure, these scaffolds act like faucet taps that control the rate and timing at which anti-bacterial compounds are released. “I look at our fibers as delivery platforms,” Loboa said.